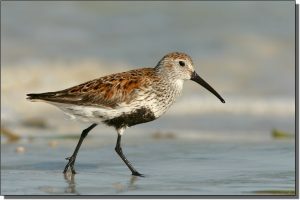 Description: Dunlins are sparrow-sized sandpipers with long, black, droopy bills and relatively long, black legs. In breeding plumage, Dunlins are comparatively easy to identify because of the conspicuous black belly patch and rufous cap and mantle. In the nonbreeding season, they are plain gray-brown on their upper parts and white below. A prominent white wing stripe, seen in flight, is present in all plumages. 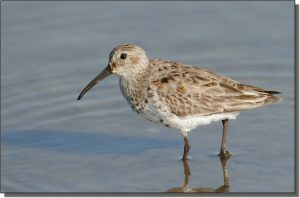 Similar Species: In nonbreeding plumages, Dunlins are easily confused with other calidrine (birds belonging to the genus Calidris) sandpipers. Sanderlings are whiter. Baird’s and White-rumped sandpipers are smaller and their wings project farther past the tail. Western and Semipalmated sandpipers are also smaller. Least and Pectoral sandpipers both have lighter colored legs. Red Knots are chunkier. All have shorter, straighter bills. Dowitchers are much larger, with longer, straighter bills. Stilt Sandpipers have longer, greenish legs. 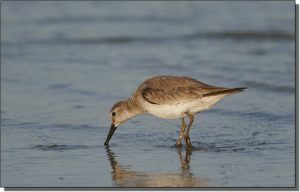 Curlew Sandpipers are rare in the region and are longer legged, with a longer, more evenly decurved bill and a distinctive white supercilium. Comments: Large flocks are seen within the northern Great Plains during migration between tundra breeding areas and coastal wintering grounds. Within the southern Great Plains, Dunlins are not as common. At least nine subspecies of Dunlins are found throughout the world.